– J type hooks are useful for industrial maintenance designed to lift hollow pieces, commonly circular, such as steel tubes, wind turbine tower sections, etc. 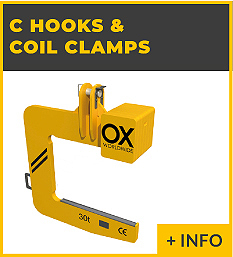 Unlike the C Hooks, the J hooks are designed to work in pairs, one at each end of the piece, so the capacity of each unit is half the weight of the load. Usually hoisting is carried out with two independent crane hooks that could be hoisted with a single crane with the help of a lifting beam or a Spreader Beam. 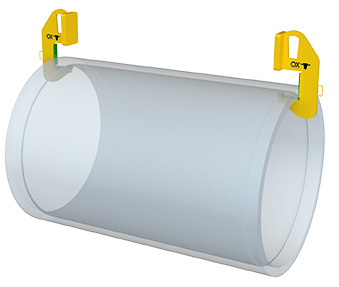 It has a horizontal surface slightly curved to support the inner circumference and sometimes has some recess to free elements such as the flange of the tube. The coupling point is located in the center of mass of the tool itself for horizontal hoisting. 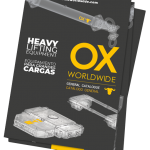 – Upper fixings: Oxy-cutted and rounded top eye for simple crane hooks, mechanized bolts with centering holes or hooks with commercial elements such as 2 leg chains. 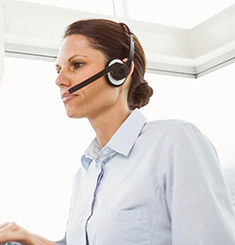 – Protections of High Density Polyethylene or Polyurethane Shore 85ºA at the base and front to avoid damage to the material to be supported or in other areas for possible contacts to be determined by the customer. 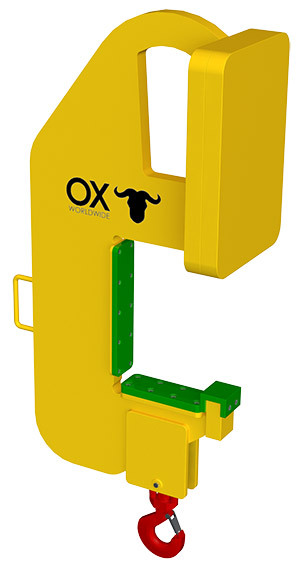 – Oversized to withstand high temperatures, specific support stand, calculation and analysis by finite elements.